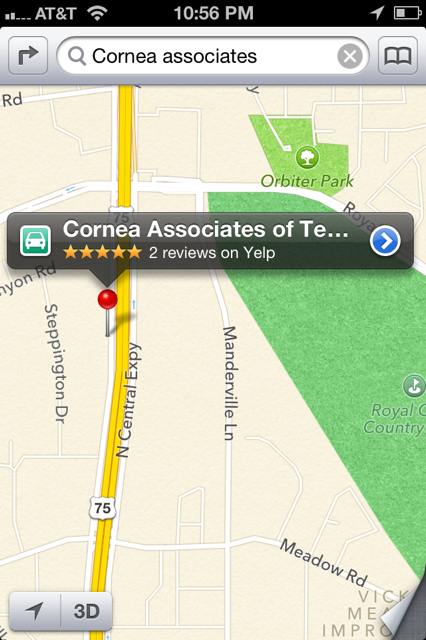 The big news, for me at least, is that this confirms that Open Street Map data is still being used by Apple Maps. 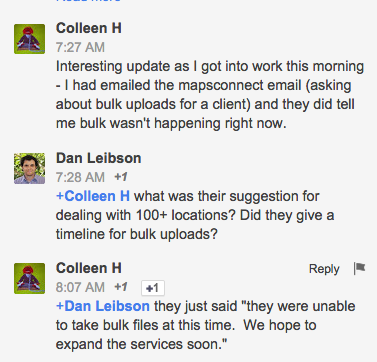 So if you are having mapping data issues (e.g. your street doesn’t show up on Apple Maps) then fixing them on Open Street Map is still worth doing. As I said about a year ago, “Apple Maps has actively tried to keep businesses located in residential areas out of the maps”. Looks like a similar notification was shared on Linda Buquet’s Local Search Forum. Should Agencies Put All Clients in One Apple Maps Connect Account? We have no idea how Apple is going to evolve Maps Connect. Unique IDs for each client allows a lot more flexibility for testing as Apple rolls out new features. When agencies set up a master account for Google Analytics or Google Webmaster Tools that includes a large number of different clients, it often can be problematic for the client to gain control of their accounts if they part ways with the agency. Unique IDs makes it more likely that you can give the client control if they want it. And you should probably be using the client’s domain in their Apple ID email address. I imagine there are going to be a lot of bumps in the road for agencies as this service grows. IMO the best policy at the moment is to try to anticipate how this system could screw you down the road and take the path that seems most likely to avoid the screw. Posted byAndrew Shotland October 23, 2014 Posted inSEO1 Comment on Should Agencies Put All Clients in One Apple Maps Connect Account? UPDATE 10/23/14: As you can see, their bulk listing process may not be up and running just yet. I would still submit just to get in the queue. For more tips on Apple Maps Connect see our Apple Maps Connect FAQ. Changing Business Name? Don’t Forget About Apple Maps! Today a retailer client, let’s assume they are called “Bingo’s”, pinged me because they had sold one of their locations, let’s say to “Bozo’s”, and their brand was still appearing on the business’ Yelp profile. So when you searched “bingo pleasanton ca” in Google the Bingo’s Pleasanton Yelp profile showed up as the top result. The problem was that Bozo’s had created a Bozo’s Pleasanton Yelp profile but Bingo’s had never shut down or changed the name of the old Yelp profile. And this was happening across all of their local listings on various sites such as YP.com, MerchantCircle, etc. The Google solution was pretty simple – we used Yext Powerlistings to instantly change the names on all of the Bingo’s Pleasanton profiles in Yext’s network and we updated their Google My Business page and the information at the main data aggregators. 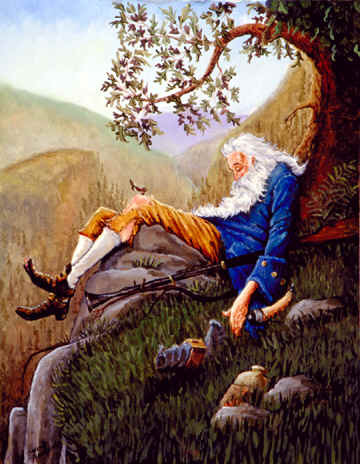 In some cases this involved closing down the Bingo’s listing at the data aggregators. Most SEOs would stop there and think that their work was done. Wrong. A quick search for “Bingo’s Pleasanton” on Apple Maps revealed that there was both a Bingo’s Pleasanton listing and a Bozo’s Pleasanton listing. Even though we had fixed the issue at the data aggregator level which in theory would find its way eventually to Apple Maps, that still doesn’t mean that it would get fixed in Apple Maps. So we used the “Report a Problem” feature and marked the business information as “incorrect” and submitted the name change to the Bingo’s listing. Alternatively, we could have marked the location as closed, but I wanted to see if Apple Maps could figure out to merge the two listings based on the name change. We’ll see. The moral of the story is that because Apple Maps data does not show up in Google, marketers are likely to forget about it when doing big things like changing brand names, changing addresses, etc. 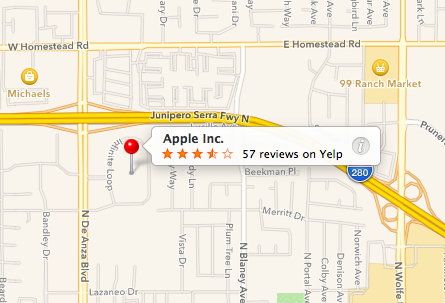 Apple Maps is one of the most used local search services on the planet. Ignore it at your business’ peril. Posted byAndrew Shotland October 16, 2014 October 16, 2014 Posted inSEOLeave a comment on Changing Business Name? Don’t Forget About Apple Maps! Apple Maps updating system appears to be getting faster. As I mentioned a few weeks ago, we have started to see more submitted updates go live. And I just noticed one case I had been watching for two years where a business’ map pin was displayed across the street from its actual location is now correctly located. 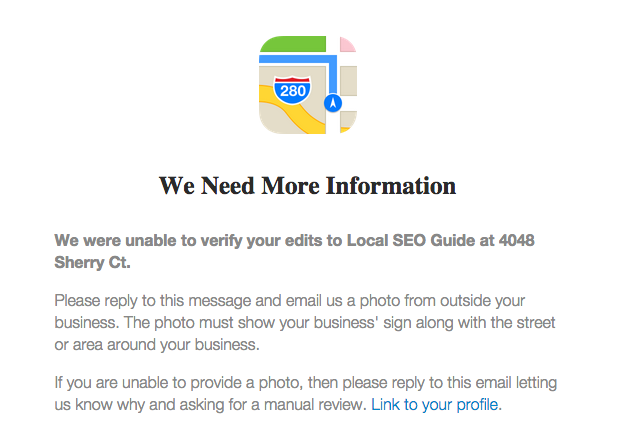 So six days ago, when I noticed the Apple Maps pin for my company, Local SEO Guide, Inc., was about 50 feet off base, I used the Report a Problem tool to move the pin and voila, today it’s now in the right place. And if you’re interested in more Apple Maps updating news, according to this Reddit thread, for the past couple of months Apple Maps has been making daily updates at 3:00am Eastern Standard Time. 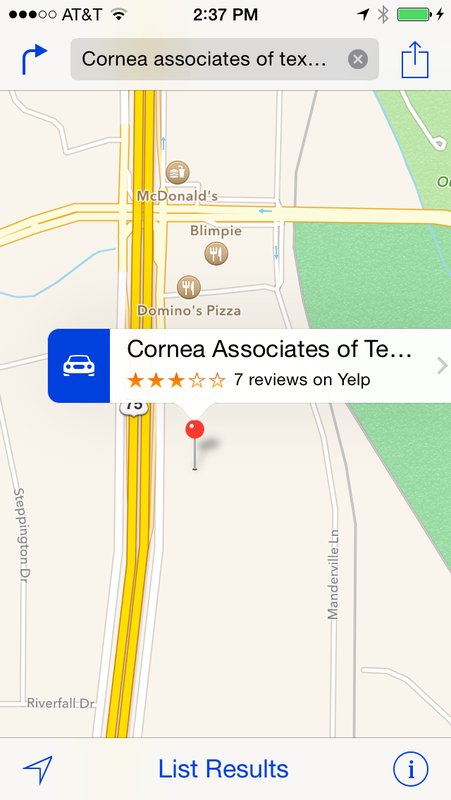 “A leading provider of design, measurement and visualizations technologies.” I am presuming they are providing some whiz-bang new stuff in the updated Apple Maps. “The only map provider in Taiwan that concentrates on producing digital maps at present.” I am guessing Apple Maps Taiwan just got a lot better. If you need to fix a Taiwanese listing, I am thinking this is where to look. The Kingwaytek of New Zealand. So no new sources of U.S., European or South American data. There are still a lot of countries that don’t have business listings. I am still puzzled over the old copyright dates for Acxiom (2012), Factual (2012), Localeze (2012), Yelp (2013) and Open Street Map (2011, 2012). It’s unclear if this means that this data is basically frozen in time, meaning no need to update these sources to get your data updated in Apple Maps, or if Apple just didn’t care enough to update the info. It is September 2014 after all and we’re just getting the 2014 update. Often when we fix Apple Maps issues we can see it take effect relatively quickly (60-90 days is what I usually tell clients but we’ve seen faster, and slower of course). But after 60 days the business still wasn’t listed and the Factual data had not updated. I figured this was the issue. Because of the way Factual works, it wasn’t enough to update the data at Factual (where I have a “power” account), we had to fix citations that Factual relies on to triangulate the data. So we did a citation clean-up which took about three months for Factual to acknowledge and update. But still DC 9 was nowhere to be found on Apple Maps. It was then I realized that I had neglected to take into account the “geo-spatial data”, or whatever the map geeks call it, that Apple uses to create the maps. This data is stuff like streets and buildings and lat/longs, etc. that businesses get mapped to. So I popped DC 9’s address into TomTom/Tele Atlas, one of the underlying mapping data providers, and lo and behold, DC 9’s address of 1940 9th St NW Washington, DC 20001 did not exist in these systems. And when you just searched the address in Apple Maps, the pin showed up at 1938 9th St NW, the building next door, which had originally been part of 1940 until the building was split in two, which probably is why these mapping systems couldn’t figure things out. So even though we had fixed the citation issues, there was nowhere to put the business on the map. So I went over to TomTom and Tele Atlas‘ sites and submitted edits to their maps to add the address. Within one week the edits had been approved and then I waited…til yesterday. Last night (September 10th, 2014) I got an email from DC 9’s owner, who had long given up hope, that DC 9 was now on Apple Maps! So if you are trying to add your business to Apple Maps, make sure you’ve got at least five months of patience, but be prepared to wait a year. For further reading on Tele Atlas and Apple Maps, check out Mike Blumenthal’s Good News, Bad News in the Apple Mapping Business Listing World. Posted byAndrew Shotland September 10, 2014 September 10, 2014 Posted inSEO1 Comment on How Long Does It Take To Get A Business On Apple Maps? Got A Year? EE may push iPhones over Androids so this doesn’t necessarily mean this data applies to all carriers across the board, but every day Apple Maps is getting better and every day thousands of people get a new phone with Apple Maps pre-installed. Apple Maps is for real. You might want to pay attention to it. Greg Sterling posted today about Apple Maps’ “new” expanded list of data providers which you can find at http://gspa21.ls.apple.com/html/attribution.html. Unbeknownst to Greg is that this list was updated sometime around the launch of iOS7 in the latter part of 2013. Here’s a November 2013 snapshot from the Web Archive. The copyright for Open Street Maps data is 2012. This implies that updated OSM data is not being used in Apple Maps. If that is the case, then making edits to OSM should not have any effect on Apple Maps. Why are we in May of 2014 and still seeing “Copyright 2012-2013”? Where’s the 2014 update? This does not speak well to Apple’s much-vaunted attention to detail and it makes me wonder what’s going on over there. It’s a small thing to be sure, but doesn’t Apple always sweat the details? Perhaps Apple Legal has been too busy suing Samsung to pay attention to this stuff.